Toronto Masque Theatre is currently presenting the most enjoyable production of Handel’s Acis and Galatea I have ever seen. Not only is it beautifully sung and played, but it is staged in an intimate space with simplicity and imagination. After the noise and confusion of the holidays, Handel’s exquisite music feels like a spiritual cleansing. Acis and Galatea was Handel’s first dramatic work in English and he wrote its first version as a one-act masque while resident at Cannons, the stately home of James Brydges, 1st Duke of Chandos, in Middlesex. The libretto is by John Gay, most famous as the author of The Beggar’s Opera (1728), who based it on the tale in Book XIII of Ovid’s Metamorphoses. What is known about the first performance is that there were only five singers who sang the principal roles and doubled as the chorus. The first version was orchestrated for a minimum of seven players. The work underwent several revisions until Handel adapted it to the two-act version in 1739 which is the one most performed today and by the TMT. Taking its cue from the masque’s original setting, TMT has staged the pastoral opera in the lovely Enoch Turner Schoolhouse, Toronto’s first free school and one of Toronto’s oldest surviving buildings. The lovely square interior was divided into thirds, with two thirds devoted to audience seating and one third set aside for the TMT Orchestra and chorus and the playing area for the masque. The four narrow supporting columns were decorated by designer Lindsay Squire with greenery and tiny strings of lights, while one long garland connected the two columns at the end under which the orchestra was placed, thus the simple impression of a bower. To give the impression of a performance in a private home, small tables, some decorated with tiny sheep for pastoral effect, separated the ranks of seats and patrons were allowed to take drinks from the bar into the auditorium. Following another lead from the first performance, the orchestra consisted of only eight members, with doubled violins, a practice that would have been common at the time. Also, as in the original production, the leads sang as members of the chorus. Here, the prime difference was that the chorus consisted of eleven singers and once the leads separated from the group to become separate characters, they did not rejoin it until the very end. question of his first air “Where shall I seek the charming fair?” directly to various members of the audience causing some to respond with shrugged shoulders or shaken heads. He also put his hands on first violinist and conductor Larry Beckwith’s shoulders for Acis’s remark about Galatea, “No grace, no charm is wanting / To set the heart on fire”, an in-joke for those who know that Teri Dunn is Beckwith’s wife. The height of interaction with the audience came during the air of Damon, sung by Jonathan MacArthur, “Would you gain the tender creature” to Peter McGillivray as the Cyclops Polyphemus in an attempt to teach the giant how to woo a lady. Under Damon’s tutelage, Polyphemus forces himself to reign in his cannibalistic urges and went from woman to woman in the audience practicing kissing their hands though he occasionally would bare his teeth before he remembered that the hand is for kissing, not munching. As Galatea, Dunn sang with limpid grace and understated emotion. Wiliford, after frequent appearances with Opera Atelier, was the most gesturally expressive of the four. His tenor was in top form and was especially remarkable in the long crescendos Handel wrote for the role. MacArthur has a lovely light tenor, gentle and rounded, which made him the idea foil for Wiliford’s more forceful Acis. He tossed off the many runs in his first air “Shepherd, what art thou pursuing?” with perfect ease. Peter McGillivray has a large but nimble baritone and gave a rousing account of “I rage – I melt – I burn” as well as a jaunty “O ruddier than the cherry”. His claw-waving and teeth-gnashing provided the main source of comedy in the piece, but he was able to win some sympathy for the unloved giant in his air “Cease to beauty to be suing”. The libretto was provided in the programme and many in the audience chose to follow along during the performance. In fact, this was unnecessary since the intimacy of the space and the clarity of the singers’ diction made their words perfectly understandable. The TMT Orchestra played with delightful spring and clarity and achieved a completely satisfying fullness of sound. This lovely evening gave one the sense of what a performance of the much-loved piece would be like in a private home. The beauty of the singing and playing and the overall mood of playfulness eventually tinged with sadness were so enchanting I wish I could have seen all three performances. 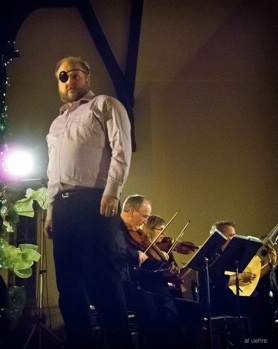 Photos: The TMT Ochestra and Chorus, ©2015 Rose Perry-McClelland; Peter McGillivray as Polyphemus, ©2015 Al Uehre.